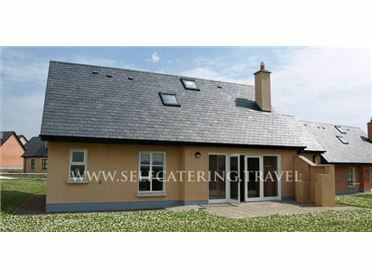 At the Crossroads is a delightful detached cottage situated just off the main Westport to Louisburgh road on a quiet country road, two miles from Louisburgh, County Mayo, and can sleep six people in one double bedroom with en-suite, a further double and a twin room. There is a family shower room. The rest of the property contains an open plan living area with kitchen, dining area and sitting area with open fire. There is a utility. Outside there is a front enclosed lawned garden and gravelled areas to the rear and sides, as well as ample off road parking. At the Crossroads is a lovely base for families or friends looking for a tranquil location within easy reach of the beach and the lively town of Westport. The small town of Louisburgh, in County Mayo, is located on the Bunowen River and has been designated as an Area of Outstanding Natural Beauty. Surrounded by lovely rural scenery, the town offers endless opportunities to explore Ireland. Boasting three Blue Flag beaches, Bertra, Carramore and Old Head, it is also in close proximity to the Sheaffrey and Mweelrea Mountains, as well as Carrownsky Beach, which is ideal for surfing; there really is something to please everybody! Oil central heating and open fire. Electric oven and hob, microwave, fridge/freezer, washing machine, tumble dryer, dishwasher, TV with Freeview, selection of books and games. Fuel, power and starter pack for fire inc. in rent. Bed linen and towels inc. in rent. Cot and highchair on request. Ample off road parking. Enclosed front lawned garden with gravelled area to the rear and side. Sorry, no pets and no smoking. Shop, pub and restaurant 3 miles. Beach 1 mile. .